A working meeting consisting of representatives from the Health Authorities, Ministry of Health, Professional Associations, and other key stakeholders across BC concerned with rural maternity health gathered in Victoria, BC to discuss potential solutions to improve maternity health services across the five 1A (no local access to caesarean section) sites across British Columbia. The basis for this meeting came from findings from the 1A Community Symposium that was held in June. 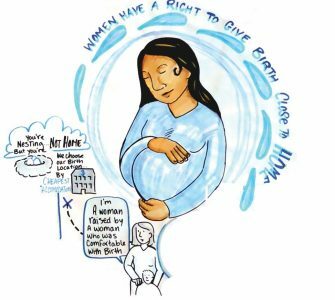 The image above shows a snippet of Jessica, a mom of two from North Vancouver Island, and her heartfelt expression about her and her community’s experiences of traveling for birth on the North Vancouver Island. It takes her 2 hours to drive down island to access midwifery services as there is no local midwifery care in the North Island. Jessica emphasized that midwifery is something women in the North Island want. When it comes to giving birth, delivering locally is usually not in question; most women choose birth location by cheapest accommodation options while others choose a place that allows home birth. Women who travel for birth often do not get to have their families with them due to scheduling challenges with work, costs of transport and accommodation, to name a few. Jessica’s story anchored the remainder of the meeting and reminded all why the policy and decision makers in the room were gathered: to find ways to create a safe and comfortable birthing experience for rural mothers. There is a strong policy context in Canada that supports ‘birth close to home’ for rural women. There is ample evidence found on the safety and outcomes of birth closer to home. Despite abundant evidence and a strong policy context that supports ‘birth close to home’, many rural maternity sites lack sufficient support, leaving many maternity services across BC to close. 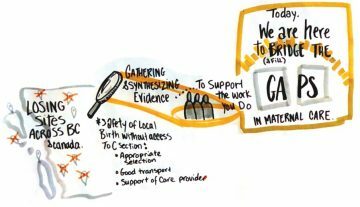 The lack of system support for these rural communities necessitated a provincial gathering to identify gaps and provide suggestions to address barriers mothers may face in birthing ‘close to home’ in BC. Policy and decision makers concerned with sustaining rural 1A maternity services converged in the afternoon of the symposium to review what is being done currently to sustain rural maternity care, challenges faced and how to best address them. Stay tuned for our next blog post which will cover the working discussion and the response from Rachel, a rural mother from Invermere. Graphic recording was live-recorded by Annalee Kornelsen.